Who doesn't love a good capsule collection? This one pairs two favourite icons. British retail giant Marks & Spencer (forever Marks & Sparks in my mind) welcomes a dose of It Girl style with a recently launched collection by Alexa Chung called Archive by Alexa. The collection takes inspiration from M&S throwback styles from the '70s, '80s and even '90s (holy Hannah are we really at at time when the '90s are a "throwback"? Yes we are and I want to barf) and reinterprets them to epitomize the Chung aesthetic. There's plenty of prim English Rose-meets-Louche Tomboy-meets-Party Girl to satisfy your inner Alexa wannabe.. This season's collection is her second collab with the English brand, which recently announced a round of store closures, mostly slated for France and China. And yes, my Alex-loving Canuck friends, M&S ships to Canada. Here are The Design Edit's favourites from the Archive by Alexa. The Templar Coat ($210CAN) is inspired by a children's coat from the '90s and borrows military influences. It boasts stitched velvet collar and pocket trim, authentic looking brass buttons and a half-belt and back pleat for a fitted ladylike silhouette. Super. Want. The Kirkgate mini ($78CAN) has a shiny vinyl finish, a high waist and A silhouette. They style it with a tucked in ladylike blouse but I see it with a chunky shrunken Aran knit. If you don't have a lady tux yet, here's your chance and it is the must-have of the season. The Clarendon tux (jacket $167CAN, trousers $123CAN) is clearly a '70s throwback tracing its origins past old time M&S and right to YSL's Le Smoking. 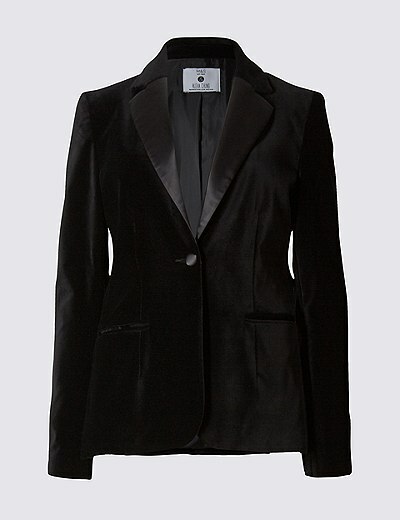 The jacket is a velvet single button style with a silk lapel and nipped in waist. The trousers are high waisted with a '70s flared leg that's all Alexa. The Briggate PVC trench ($198CAN) has a rock 'n' roll vibe and a borrowed-from-the-'70s A-line silhouette. Dress is up with a heel or keep it casual as shown here. Shop the whole Archive by Alexa Collection.